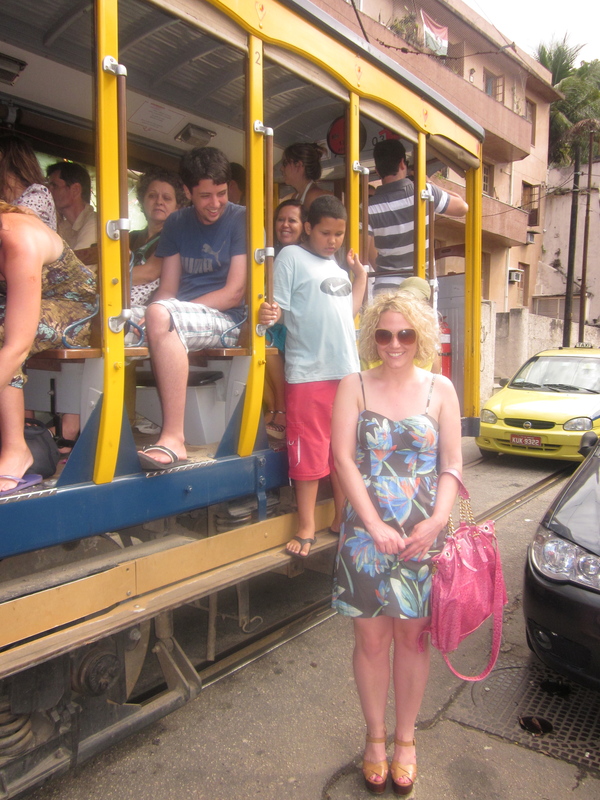 The bodinho is THE CRAZY TRAIN or in plain speak, the trolley. 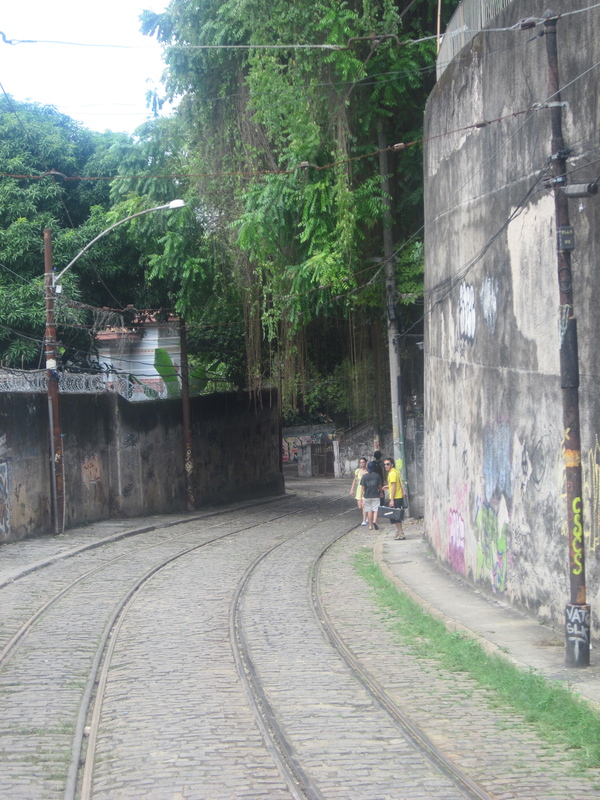 It was built in the late 1800’s to connect the city center to the neighboring, Lapa and Santa Teresa communities with the intent on transporting wealthy business class from the hills, down winding cobblestone streets to their jobs in the city center. As time passed on and the neighborhoods evolved, wealthy inhabitants moved out to up and coming neighborhoods, yet one thing remained unchanged, the bodinho. 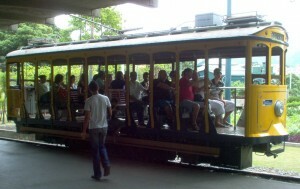 The bodinho is still in operation today, residents using it as a principle mode of transportation and tourists just for the experience. The bodinho can be picked up at the city center and taken up the hills to Santa Teresa for $0.60 reals/roughly $0.30 cents in US dollars. The journey takes you over the Carioca Aqueduct (Arcos da Lapa) an impressive architectural feat that is a main attraction in Rio. 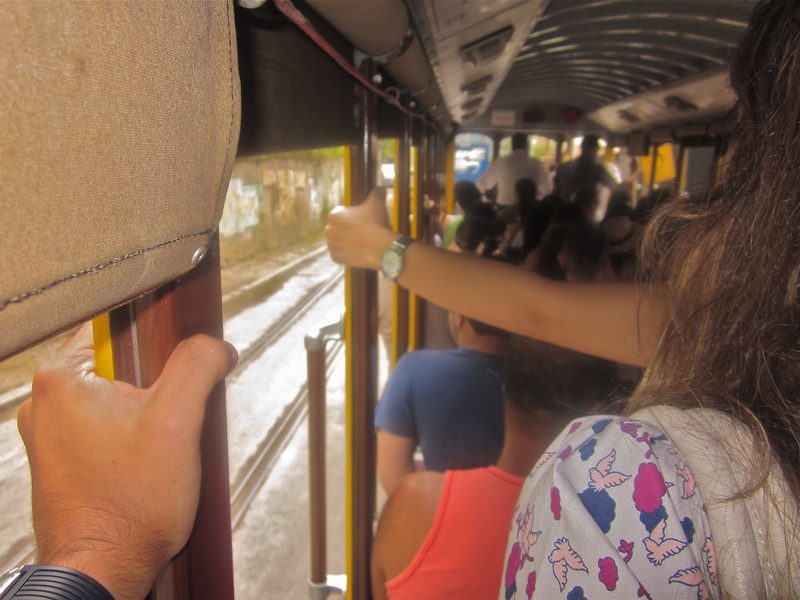 If you are planning a ride on the bodinho let me share with you a piece of advice, if the trolley appears full yet the conductor insists that you squeeze aboard be prepared! It was an exhilarating ride filled with white knuckled grasps to whatever part of the trolley that could be held, entwined with other white knuckled fists. There were no safety precautions or enclosures, simply a ride filled with fresh air at a brisk and winding pace. 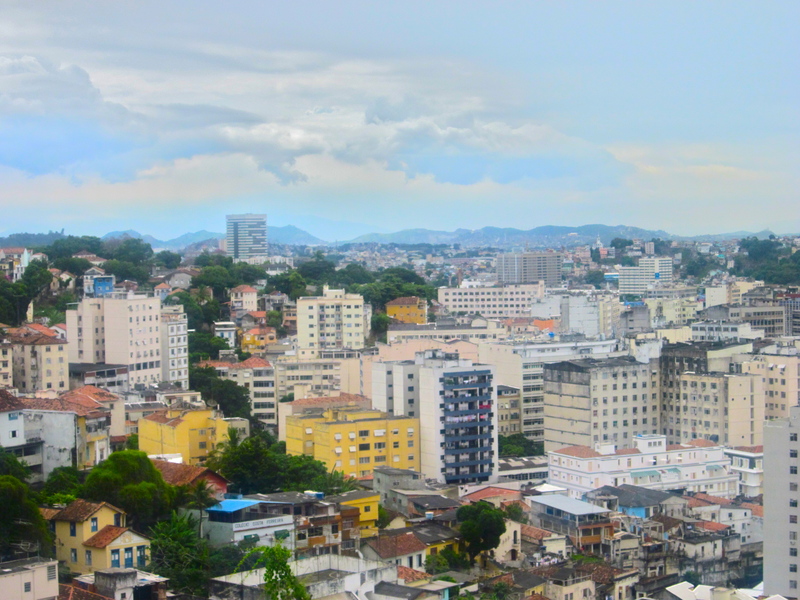 The sounds of street traffic, motorcycles packed with fruits or other necessities buzzing by, epic views of the city and street art all filled the time as the bodinho made its bumpy ascent to Santa Teresa. 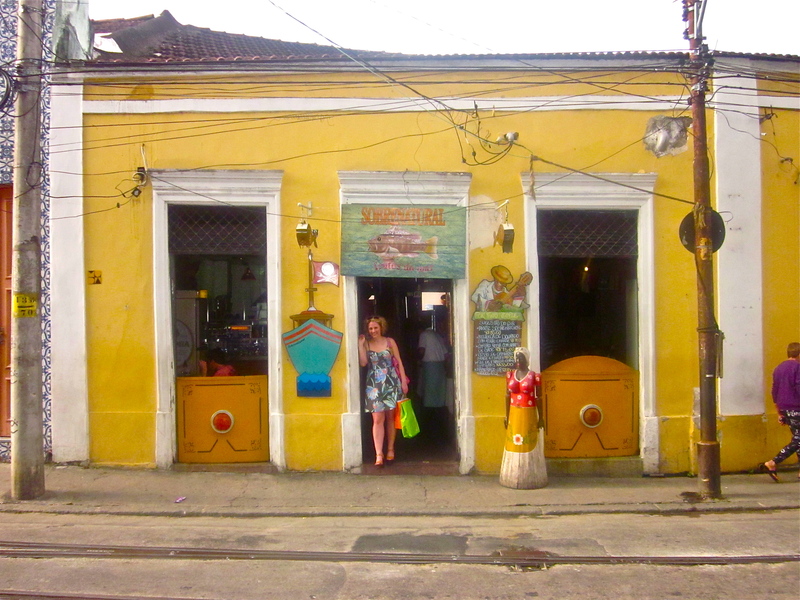 As the bodinho wound down so did my heart rate, I jumped off, legs firmly planted to the cobblestone street. The ascent to the hills gradually led me to believe that I was entering a different time period. From the busy beach life filled with taxis and skyscrapers to a place of narrowly, winding streets, elaborate homes and street music a feeling of calm and quaintness swept over me. People moved about at a slower pace, the sounds were of lower pitch and life felt easy-breezy. The crazy train worked up my appetite and thirst and food was why we made our ascent in first place! We went off of a recommendation from a friend and tried Sobrenatural, coined one of the best seafood restaurants in Rio. Strolling up to the restaurant we found it to be a yellow-washed rustic space, with fresh air and walls decked with local art. Seated at a wooden table, we refreshed over cold beers and agua con gas. My friend went ahead and ordered the spread, Pastel de Siri, Pastel de Camarão and Pastel de Queijo, basically fried pockets of goodness filled with crab, shrimp and cheese. 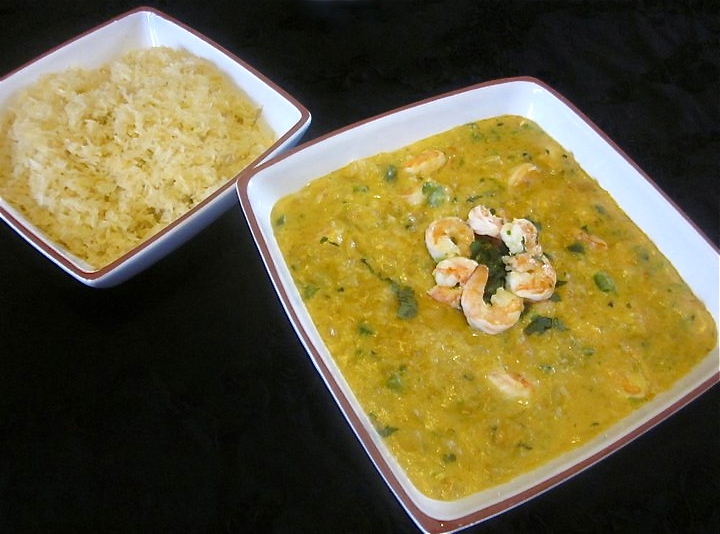 The main course was Bobó de camarão an iconic dish from the state of Bahia, known for its Afro-Brazilian culture. It is said to be a sin to visit Brazil and not try this dish! 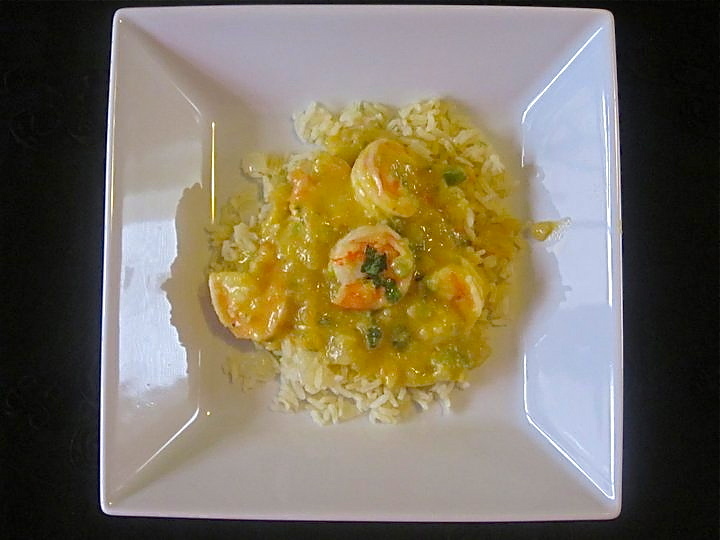 Bobò means puree and camarão means shrimp so this dish is a manioc puree with shrimp. A simple dish composed to comfort the belly and warm the heart. Before I left Brazil I was sure to purchase dendê oil (palm oil) and farofa (manioc flour) because I didn’t know where I could find them in the states. I re-created this dish for my grandparents as a way to share my experience with them. I will also share the recipe here with you! PS Dende Oil and Farofa can be obtained at African or Asian grocers. Prepare the manioc cream: In a large heavy saucepan, combine the onion, tomatoes, green pepper and cilantro with the mashed manioc. Stir in the olive oil and coconut milk, then heat over medium-high heat, stirring constantly. Cook for 10 minutes, stirring constantly, or until the cream begins to pull away from the bottom of the pan when you stir. Remove from the heat and reserve. Prepare the shrimp: Rinse the shrimp well in plenty of cold running water. Drain. In a large, deep saucepan combine the drained shrimp, chopped garlic, salt, cilantro, tomatoes, onions, green pepper and the olive oil. Heat over medium high heat, stirring frequently. When hot, add the coconut milk in 1/2 cup amounts, stirring after each addition to completely mix. Continue to cook for 5 minutes more, stirring constantly. Add the reserved manioc puree to the shrimps and continue to cook for 5 more minutes, stirring frequently. Just before removing from the heat, add the dendê oil and mix it in completely. Remove from heat, pour into a decorative deep serving platter, sprinkle with additional cilantro if desired and serve immediately. Posted on May 9, 2012 October 31, 2017 by Table Without BordersPosted in TravelTagged Arcos da Lapa, Bobó de camarão, Bodinho, Dende Oil, Farofa, Lapa, Manioc, Pastel de Camarao, Pastel De Queijo, Pastel de Siri, Rio de Janeiro, Santa Teresa, Sobrenatural, Urca.